New Britain Bees team officials today named Stan Cliburn the first manager in team history at a press conference at New Britain City Hall. "Stan Cliburn is a winner," said Bees GM Patrick Day. "That, combined with his previous experience in New Britain, and in the Atlantic League, made him a perfect choice to lead the Bees on the field in 2016." 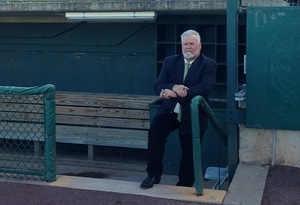 Following a 15-year professional playing career as a catcher where he reached the major leagues, Cliburn began his ascension through the minor league coaching ranks, taking his first job as a manager with the New York Penn League (A, Pirates) in 1988. That season was the first of what has become a 28-year coaching career, with 25 of the 28 years spent as a manager. Included in his 25-year managerial career are 5 very successful years with the New Britain Rock Cats (AA, Twins), which were highlighted by the team's 2001 Eastern League championship. Cliburn has most recently been manager of the Southern Maryland Blue Crabs of the Atlantic League, where he guided the club to the 2015 Atlantic League Championship Series. Cliburn has amassed more than 1,500 career wins as a manager in professional baseball and has managed at the Single-A, Double-A, Triple-A and Atlantic League levels. "I'm excited to get back to a place where I've spent a lot of successful years and bring another winner to the fans of Hard Hittin' New Britain," said Cliburn. "We're going to put together a roster of players that bring passion, energy and excitement to New Britain Stadium every night in 2016." The New Britain Bees are a member of the Atlantic League of Professional Baseball and will begin play at New Britain Stadium in April of 2016. For further information or to become a season ticket holder in the "500 for 500" promotion, email info@nbbees.com, call 860-826-BEES (2337), or visit NBBees.com.